Rare, short bursts of ‘alien’ cosmic radio waves that puzzled astronomers since there detection nearly 10 years ago may have originated from a dwarf galaxy more than three billion light years from Earth, scientists including one of Indian origin have found. A repeating burst was discovered in 2012, providing an opportunity for researchers to repeatedly monitor its area of the sky with the Very Large Array (VLA) in New Mexico and the Arecibo radio dish in Puerto Rico. The VLA last year detected a total of nine bursts over a period of a month, sufficient to locate it within a tenth of an arcsecond. Larger European and American radio interferometer arrays pinpointed it to within one-hundredth of an arcsecond, within a region about 100 light years in diameter. Deep imaging of that region by the Gemini North Telescope in Hawaii turned up an optically faint dwarf galaxy that the VLA subsequently discovered also continuously emits low-level radio waves, typical of a galaxy with an active nucleus perhaps indicative of a central supermassive black hole. The galaxy has a low abundance of elements other than hydrogen and helium, suggestive of a galaxy that formed during the universe’s middle age. The origin of a fast radio burst in this type of dwarf galaxy suggests a connection to other energetic events that occur in similar dwarf galaxies, said Casey Law, an astronomer University of California, Berkeley in the US. Extremely bright exploding stars, called superluminous supernovae and long gamma ray bursts also occur in this type of galaxy, he said. Both are hypothesised to be associated with massive, highly magnetic and rapidly rotating neutron stars called magnetars. Neutron stars are dense, compact objects created in supernova explosions, seen mostly as pulsars, because they emit periodic radio pulses as they spin. “All these threads point to the idea that in this environment, something generates these magnetars,” Law said. “It could be created by a superluminous supernova or a long gamma ray burst, and then later on, as it evolves and its rotation slows down a bit, it produces these fast radio bursts as well as continuous radio emission powered by that spindown,” he said. 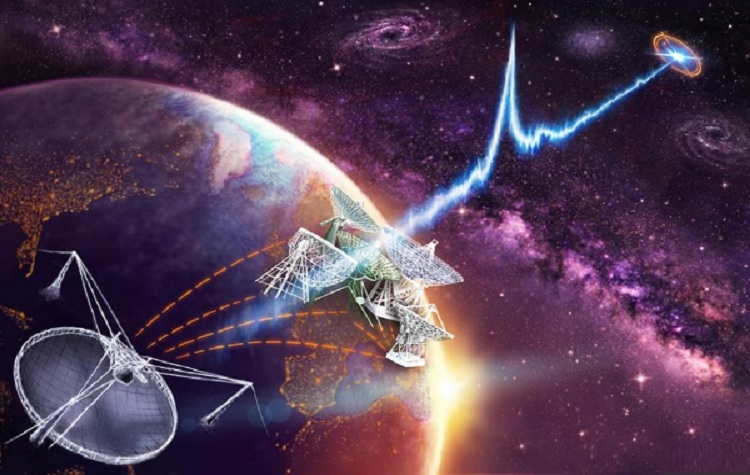 “Finding the host galaxy of this FRB, and its distance, is a big step forward, but we still have much more to do before we fully understand what these things are,” said team leader Shami Chatterjee of Cornell University. The research was published in the journal Nature and the Astrophysical Journal Letters.